Most readers will be aware that the UK Prime Minister, David Cameron, has appointed Lord Justice Leveson to oversee a public inquiry into phone hacking and media regulation. 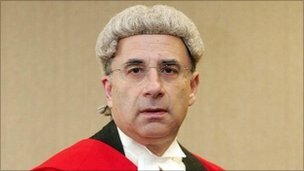 Sir Brian Henry Leveson QC is also known as Lord Leveson. His surname is one of those tricky British names not necessarily pronounced in the way the spelling would lead you to expect. According to the BBC Pronouncing Dictionary of British Names (1990), the Christian name (forename) Leveson is ˈluːs(ə)n, and the surname Leveson-Gower, the family name of the Earls of Granville, is ˈluːs(ə)n ˈɡɔː(r). When set in his assault. "Why don't you get it fixed?" EPD/CPD confirms ˈluːs(ə)n in Leveson-Gower, but does not tell us anything about a forename. It does, however, say that the simple surname Leveson is ˈlevɪs(ə)n.
That didn’t stop the Home Secretary, Theresa May, referring to him as Lord ˈliːvɪsən in the House of Commons yesterday. 1. Where does the sh in Looshun come from? 2. I never knew - not that this bothered me much - whether Gower is gɔə, same as gore, which is routinely given as identical. The rhyme with fɔː speaks against this. 4. Scansion implies the author has sn ˈdʒɒn (or more than two syllables for Cholmondeley), which ruins the point. But how shall I pronounce "Gower"? I have a rhotic accent and a NORTH-FORCE distinction, so I can't take gɔː at face value. For me, any of gɔː, gɔr or goːr would be consistent with the above IPA. This is one of those cases where a respelling system (like the one they had in the OED) would actually be more useful than IPA. Then we could distinguish between the above options with gaw, gor or gore. Pete: there is a respelling system of sorts in the poem above, which gives "gore". @Pete, are you aware of Wikipedia's IPA system for English that attempts to cover the major varieties of English? I can't take the poem's respelling too seriously either, since it rhymes gore with for. For me these don't rhyme so I have to assume the poet doesn't have my three-way distinction! But gore (with the FORCE vowel) would seem the most natural way (or the least unnatural way) to interpret gɔː given the spelling. Are there any English accents which diphthongize it as ɔo? Also on the hacking scandal, I find it strange that some journalists are calling the News of the World's ultimate parent company njuːz kɔː. The company's name is News Corporation, colloquially abbreviated to News Corp: clearly, the second word in this abbreviation is not the French word corps ('body'), which is what journalists must be thinking of when they pronounce Corp as kɔː. I can't see any justification for making the p silent in this word. What on earth has spelling to do with it? kɔː(r) is the first syllable. The homophone corps has become totally Englished and has a meaning tolerably close to corporation. The justification is unanswerable: custom and practice — surely the only reason any word or other lexical item is pronounced the way it is. Everyone has said kɔː(r) for as long as I can remember. kɔː(r)p is either jocular or short for corporal. What is this "homophone corps" (with "a meaning tolerably close to corporation") you're on about, David? I've never come across it in my more than 60 years' experience of English..! Steve was asking why "News Corp." (as an abbreviation of "News Corporation" sometimes gets pronounced with the "p" sounded and sometimes as if "Corp." were the loaned-from-French word "corps" (as in "esprit de corps"). I've noticed this split too, though -- in my hearing -- those commentators who drop the final "p" in "News Corp." have invariably been American, leading me to think that that is how it is said over there. I've yet to hear a BrE speaker say it that way, though. Kevin, you must have lived a very sheltered life down there in Swansea. At school (in England) we had a Combined Cadet Corps. There is a Royal Army Corps. The Americans have a US Army Corps of Engineers. In each case it's pronounced kɔː(r), as a homophone of core. Corp. and corps are not homophones in the LPD. I don't drop the final "p" in "News Corp". I spell kɔː(r) with a P to distinguish it from the expression of surprise Cor!. I'm pretty sure I've heard both (British) MPs and (probably British) BBC journalists use the 'silent p' pronunciation. I'm also pretty sure that, when I worked for News International in the 1980s, everyone around me called the parent company ˈnjuːz ˌkɔːp. I think it has to do with the way he pronounces /s/ and /z/, and maybe also /l/. Though I lack the terminology to describe it adequately. Why would the Beatles have called their company Apple Corp if it hadn't been a pun on apple core? As Lord Justice Leveson made clear in his opening remarks today, he is emphatically not 'Lord Leveson'. I wonder if kɔː(r) for "news corp" is influenced by "press corps". Such influence should not apply to "Citicorp", "GenCorp", "Suncorp", "Transcorp", "U.S. Bancorp", "Westcorp", or "VisiCorp".